Head-turning express styling and a spacious cockpit with seating for 7 or 8 adults. 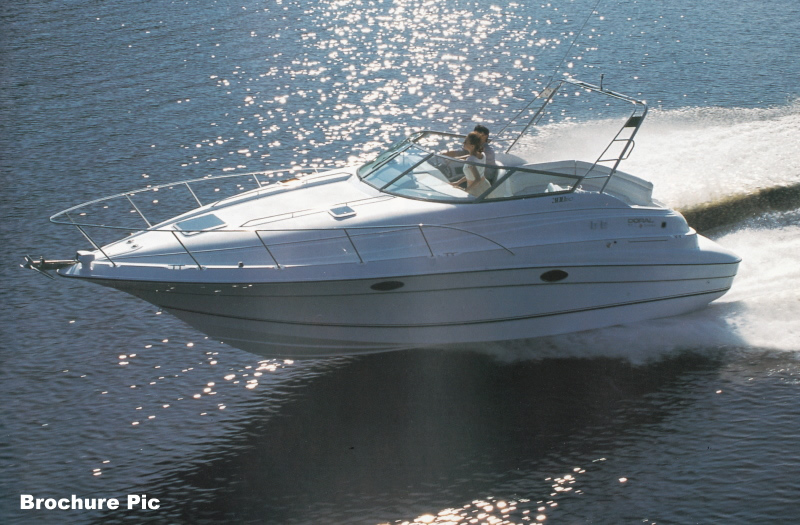 This is Doral's Generation II line of sport cruisers with revolutionary cab-forward design. Available in two versions, the 300 SC has a slightly smaller cockpit and a larger cabin space than its 300 SE sistership. This clean, well maintained 300 SC surveyed in 2017 with an "above average" rating. A new Nova Kool fridge was installed in 2011 and there is an extended swim platform in addition to the standard integrated platform. She has all the amenities needed for a comfortable week or two of cruising, including a fully canvas-enclosed cockpit. If you are looking for an affordable family cruiser with lots of people space up top, Doral's 300 SC fits the bill very nicely. Located off-site. Please call in advance to book a viewing appointment.